Established in December 1987, Alex Aiken & Son Ltd was started when Alex and his son Ewan opened their first workshop in Peterhead as a two man operation. The company has expanded greatly over the years and has since become one of the leading players in the vehicle service industry in the north of Scotland, with workshop facilities in both Peterhead and Aberdeen. We can carry out maintenance contracts to comply with Operators Licence specifications. Our recently extended workshop provides 2 additional service bays, including our new VOSA Designated Test Lane. With Alex Aiken and Son Ltd, you can be sure of a reliable service. 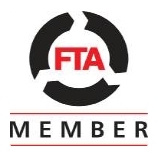 We're a proud member of the Freight Transport Association, meaning we do everything we can to help you deliver sustainable and efficient logistics, and help you stay safe and legal on the road.